"As you are shopping for the holidays, purchase an extra hat, scarf or a pair of gloves or mittens and drop them off at a TCF Bank branch. It’s a simple act and it is a great way to make a difference in our community." 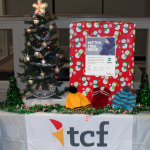 WAYZATA, Minn. & MILWAUKEE--(BUSINESS WIRE)--TCF Bank, a subsidiary of TCF Financial Corporation (TCF) (NYSE: TCF), and Milwaukee Public Schools (MPS) today announced that they are accepting donations of new and gently used hats, scarves, gloves and mittens to support the Mitten Tree Drive. For the fourth, consecutive year, collection sites are located at each of TCF Bank’s 10 branches in the Milwaukee area and at MPS Central Services. All store-bought and handmade items dropped off between November 19, 2018 and January 11, 2019 will be donated to MPS students, ensuring they stay safe and warm as temperatures drop during the fall and winter months. 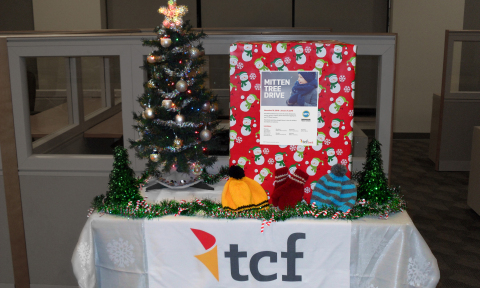 To learn more about the annual Mitten Tree Drive, please visit http://mps.milwaukee.k12.wi.us/en/Community/Get-Involved/Mitten-Tree-Drive.htm . TCF is a Wayzata, Minnesota-based national bank holding company. As of September 30, 2018, TCF had $22 billion in total assets and 315 bank branches in Arizona, Colorado, Illinois, Michigan, Minnesota, South Dakota and Wisconsin, providing retail and commercial banking services. TCF, through its subsidiaries, also conducts commercial leasing and equipment finance business in all 50 states and commercial inventory finance business in all 50 states and Canada. For more information about TCF, visit tcfbank.com.